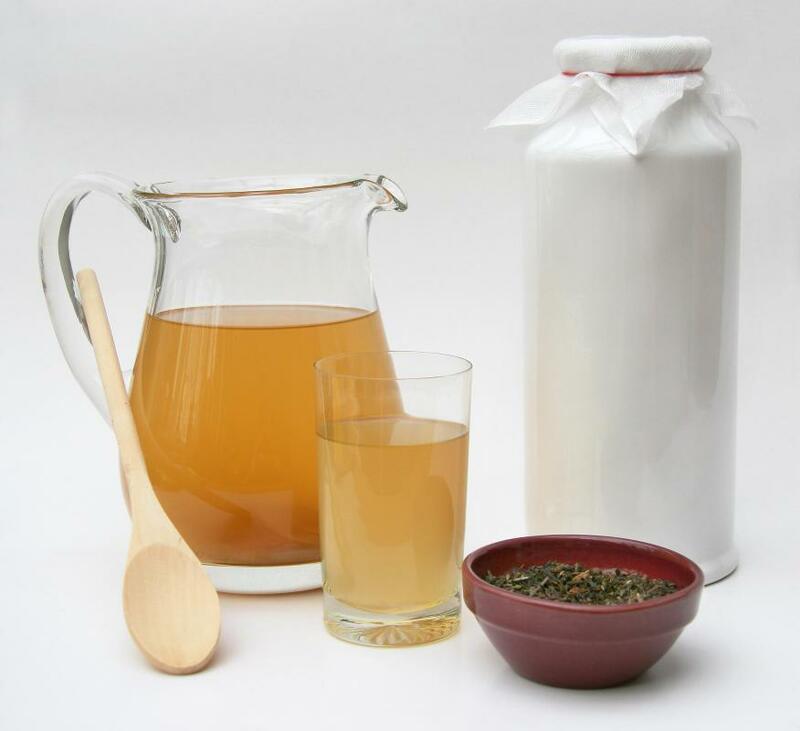 Kombucha is a yellowish mixture of bacteria and yeast. Ingredients for making kombucha tea include green tea, sugar, hot water and a wooden spoon for stirring. Brewing kombucha, also known as mushroom tea, requires very careful preparation. Kombucha is a fermented beverage made of tea and bacteria cultures. For the last 2,000 years in Asia, families drank it for its purported medicinal qualities. The special yeast and bacteria cultures are usually circulated person-to-person, although now mixtures can be purchased online. This homeopathic drink tastes tart but full-flavored, like carbonated apple cider. Recipes for this beverage have traveled to Korea and Japan, from there to Russia, and finally reached Europe after WWI. You must have a "mother brew" to cultivate kombucha, which is why originally it was handed down through generations of a family. Much like yogurt, a cup of kombucha can be reserved to make the next batch. This is because it is a living brew, with microorganisms that are beneficial to our digestive tract and others claim help other internal systems. The culture is not a fungus, as some report, but a mixture of bacteria and yeast that forms a gelatinous, yellowish substance. Brewing and cultivating kombucha is a highly personalized process with lots of room for experimentation, rather than a recipe with exact amounts. 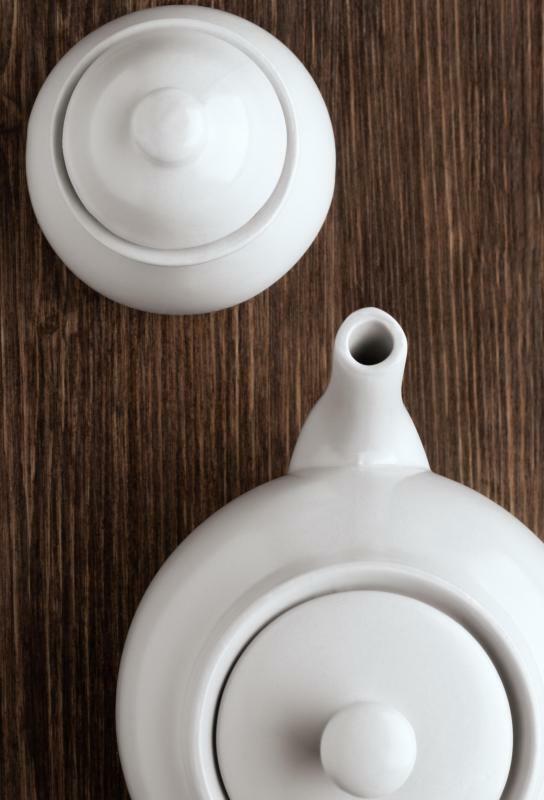 You infuse a green or black tea, such as Sencha or Darjeeling, in a glass or ceramic container of boiling water. Add some granulated cane sugar to the hot water so it completely dissolves. When this mixture has cooled a bit, stir in the mother brew, and a piece of the kombucha jelly. Only use plastic or wooden spoons, as metal will kill bacteria. Now the liquid is ready to ferment for a little more than a week in a warm area, but not in direct sunlight, with a cover of muslin. This way, you encourage a clean growth of bacteria and allow oxygen to circulate. The bacteria turns sugar into carbon dioxide causing slight carbonation. After fermentation, the brew can be strained and stored in the refrigerator to drink. While the health benefits of this drink have not been officially evaluated as a medicine, many people have experienced positive effects from 1/2-2 cups (120-470 ml) a day. It's said to be calming, aid in digestion as the bacteria stays in our intestinal tract, ease the pain of arthritis, improve immunity, and lower cholesterol. A poultice of kombucha can be applied topically to sores as an antiseptic. Some people even drink it to detoxify, as a part of an overall health strategy such as a vegan diet, a juice fast, or only eating raw food. What are the Side Effects of Kombucha? What is Green Tea Extract Used for? Where can I Buy Kombucha Tea? What are Different Types of Tea? What are the Effects of Potassium Deficiency? Whatever the folks who didn't have success made or had doesn't sound like Kombucha that I brew. When done properly it's very tasty and fizzy, almost like a hard apple cider. If left to brew longer than the 7-10 days suggested, it can get pretty vinegary. I prefer it to be sweeter. Kombucha is great, but tastes pretty foul. I mix mine into fruit juice (once it is harvested) and into smoothies. If you are going for a smoothie, try to add in a protein supplement for extra nutrition. Wait, so kombucha is like a big growing living blob of bacteria? That's not very appetizing! That means that the kombucha tea recipe that families pass down is really not a recipe at all, it's a cup full of slimy bacteria gelly to make more "mother brew". 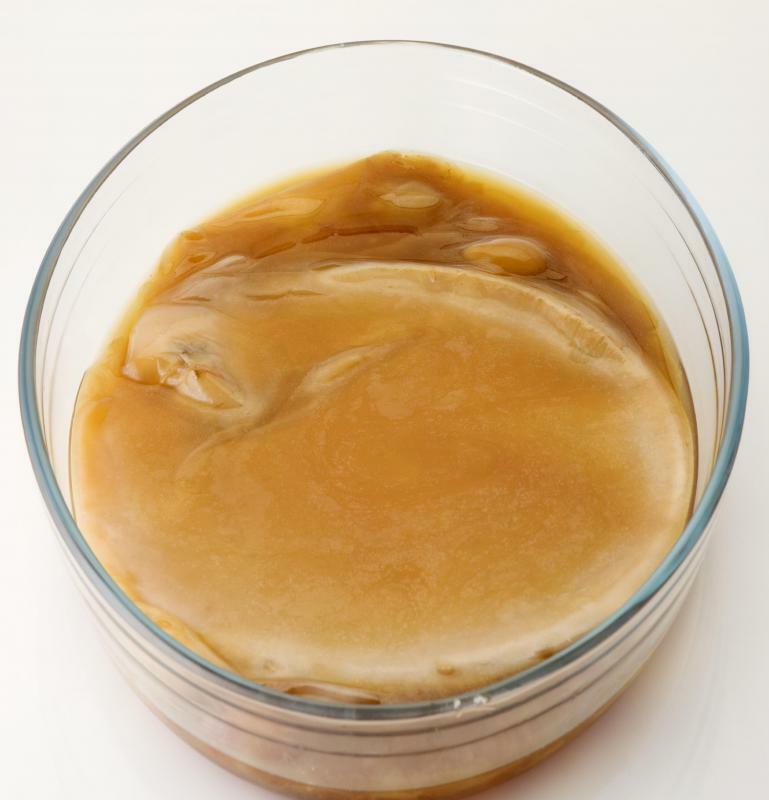 I guess it's easy to get squeamish thinking of eating the kombucha bacteria blob itself, when the actual stuff people consume is just the fizzy carbonated flavored tea drink that you make from soaking the kombucha blob in it. Pictures I looked up of the tea don't look so bad -- they're fizzy and look kind of tasty. I guess if somebody offered me some I'd give it a try, but making it at home would probably gross me out of ever wanting to drink the results! @aishia - You should try for more sugar if you don't like a tart vinegar flavor. Really, it should taste tart in more of a fruity way than a vinegary one if you're making your kombucha right. Also, because kombucha bacteria turns the sugar into carbonation, if you put more sugar your resulting tea drink will be a bit more carbonated than the tarter kind. I like mine fizzy and sweet, and for fun I make it with flavored herbal teas. Blueberry, raspberry, peppermint and Kava Kava are my favorites! I personally adore this drink as a way to get good bacteria into my body -- kombucha is a wonder drink! It promotes healthy digestion by repopulating the digestive tract with good bacteria if you've lost it from illness, so after a sickness with lots of throwing up, diarrhea or the like, kombucha can really help you get back on your feet. Lightly carbonated and sweet like apple cider, huh? When I tried kombucha, it tasted like vinegar. Judging by the descriptions of how to prepare actual kombucha, though, it sounds like I went about it all wrong, so maybe I just messed it up. I stirred the drink with a metal spoon -- like you're not supposed to, apparently -- I put it in plain water instead of tea with sugar and stuff in it, I didn't cover it up with muslin, and the end results were more like murky old vinegar than anything carbonated or remotely tasty. I think I'll follow the instructions to a T this time and see if it turns out good. People have been making this stuff for years, I ought to be able to. Anybody have any pointers on what sugar and tea ratios make for a good non-vinegar flavored kombucha drink? @hanley79 - Yeah, sounds like a rip off to me. Actual kombucha is gelatinous, kind of a orange tan, and doesn't really look like a mushroom. Since it's a soft yeast-based bed of good bacteria culture, the kombucha will generally grow in the shape of the container holding the water its growing in, so most often in pictures it will look round because people grow kombucha in canning jars or pitchers. I find that in general, if it's advertised as "kombucha mushroom" people are selling other kinds of mushrooms rather than real kombucha. I hope you try out real kombucha someday -- it's extremely good for you! My mom tried kombucha once; we ordered a piece of kombucha fungus online that was shipped to us in a bag, and it looked like a bit of mushroom. The instructions said to put it inside a pitcher of water and let it grow cultures in there, but it sounds like the description of actual kombucha is way more like a paste or gel than a mushroom bit. Were we ripped off? It was small, brown and looked like it had been cut from something. What does actual kombucha mushroom fungi look like?